Today we turn to Bucks County for the featured flagship of the day. It's Trauger Pilsner from Neshaminy Creek, which burst on the Philly beer scene nearly 7 years ago gathering tons of acclaim, still warranted today, for the classic Pilsner. We were quickly introduced to other excellent beers that I could have featured here today from Neshaminy Creek instead — Churchville Lager (Gold and Bronze medals at GABF), Croydon Cream, J.A.W.N., and Shape Of Hops To Come. If today's feature has taught me anything, it's that while I know of their Borough Brewhouse satellite location, I still have not been there. The atmosphere and food menu look like something I could spend a few hours with. 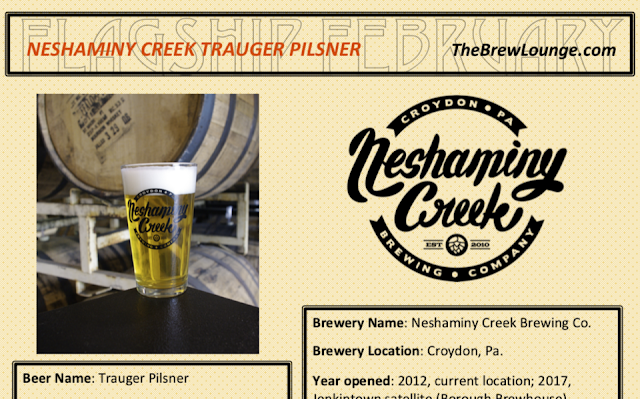 Now go click the picture below for a full feature on Neshaminy Creek's Trauger Pilsner. Disclosure: For this project, I solely created the list of 28 beers featured here on The Brew Lounge. I was in contact with each brewery and neither required nor requested complimentary samples. I purchased today's Neshaminy Creek beer at retail.